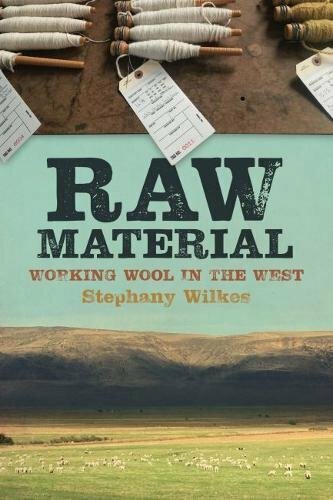 Joined by guest co-host Stephany Wilkes, sheep shearer, wool classer, and author of the fantastic new book Raw Material: Working Wool in the West. Order it at your local bookstore or online. Stephany is also president of the Northern California Fibershed Cooperative. She chats with the Ewes about her projects and then we discuss her book and her life as a shearer. Stephany can be found on Instagram as @ladysheepshearer. Full notes with photos and links can be found in the podcast section of our shop website: TwoEwesFiberAdventures.com. Join the community on Ravelry where we will give away a copy of the book Raw Material: Working Wool in the West. Kelly’s Argyle adventure continues. The socks are roughly based on the pattern Men’s Argyle socks #5710. She’s not really using pattern that much, but she used it to create a Stitch Fiddle chart for the colorwork. Also active this week are the Humble Bee socks. The pattern was a gift from Sara Bauer (sarapomegranate on Ravelry and host of the Yarns at Yin Hoo podcast). 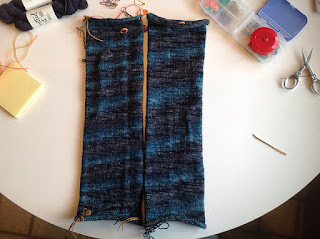 Kelly has also joined the Jane Stafford Online Weaving Guild and is excited to get back to the loom. The guild has an annual membership that gives weavers access to previous seasons of videos and also the current season of videos as they come out. At $75 Canadian it is a great value! The price will be increasing to $99 in December. Stephany is just about to bind off yet another Purl Soho Boyfriend hat, a free pattern from Purl Soho, in Lani’s Lana Rambouillet twist, a black and white wool twist, undyed. It makes the PERFECT marled hat. Highly recommend it for gift and travel knitting, a simple k1, p1 rib all the way around. 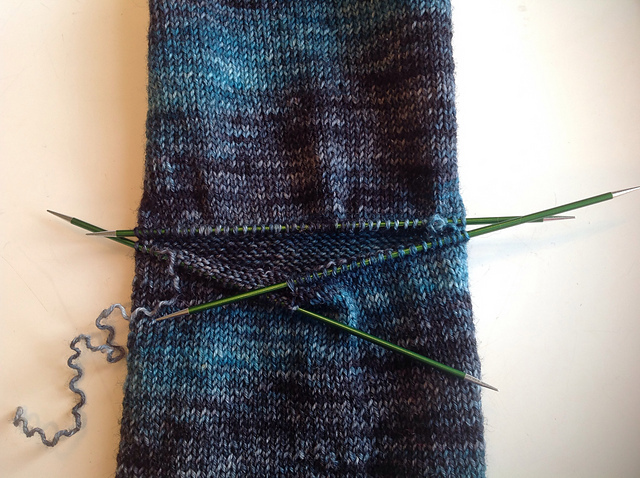 Marsha continues to work on the afterthought socks. 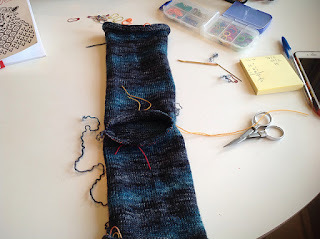 The long stockinette tube is finished and she is ready to do the steeking. Meanwhile, she has started on Rabbit, a pattern by Claire Garland. The rabbit is beginning to take shape! After the project updates the three have a wide-ranging conversation. 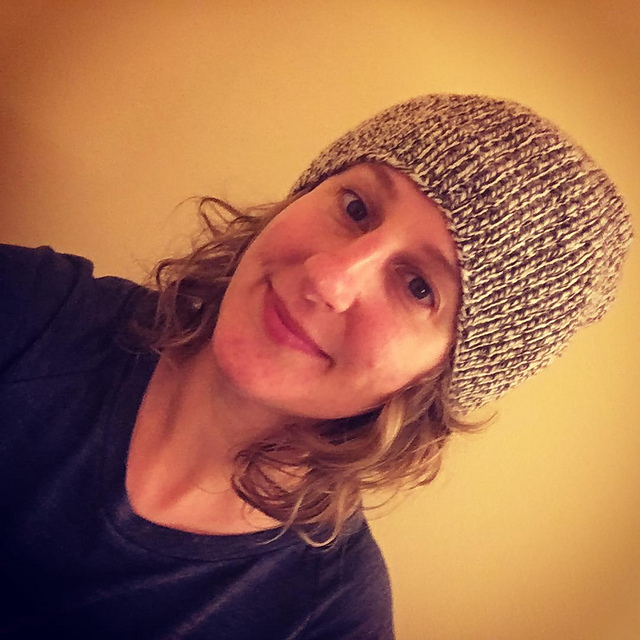 Stephany shares her journey from a knitter looking for local yarn in a California yarn shop to the sheep shearing jobs she does across the state. Topics include “urban hubris,” imposter syndrome, and the value of agricultural work; carbon farming and its potential to combat climate change; and the overlooked job opportunities in the world of sheep. For those in the Seattle area, Stephany will be at the Seward Park branch of Third Place Books for an author event on November 28 at 7 pm. Join the conversation about this episode in our Ravelry Group, or contact us with your thoughts. twoewes@twoewesfiberadventures.com is our email address. We’d love to hear from you. This was a fabulous episode. Your best so far. Keep up the good work!